Try the Lumix G9 in Preston and Liverpool stores soon! Try the brand new LUMIX G9 first with Wilkinson Cameras. Join Panasonic Imaging Expert Joshua Cunningham in Preston on Monday November 13th and in Liverpool on Sunday November 19th for an exciting first look and hands-on day with the LUMIX G9. You’ll be able to touch and try the G9, try out a huge selection of Lumix G lenses and get expert advice from Joshua. Just call in any time from 10am until 4pm. First G9 stocks due January, first 200mm F2.8 lens stock due December – make sure you’re at the front of the queue! FREE Battery Grip worth £309 when you Pre-Order a Lumix G9 between November 8th and January 14th 2018 inclusive. The DMW-BCG9 Battery Grip must be redeemed from Panasonic. PLUS £100 Part-Exchange bonus! Whatever your old equipment is worth, we’ll give you £100 more when you part exchange against a Lumix G9 or Leica 200mm lens pre-order. If you’re thinking of upgrading and taking advantage of the pre-order special offer, then bring your existing equipment along to one of the Touch & Try events, where one of our knowledgeable staff members will value your equipment while you try out the brand new Lumix G9. If you can’t make it to a Lumix G Touch and Try Event, then you can fill out a part-ex form online or visit your local store any time. Please note that values given on part-exchange requests online do not include part-ex bonuses. These are added on at the time of purchase. New LUMIX G9: new flagship camera combines speed and durability – the perfect match for wildlife photography. A new High Resolution Mode can deliver incredible 80 megapixel (equivalent) images in both JPEG and RAW – ideal for landscape and macro photographers. In essence, this mode works by combining together 8 images taken concurrently while shifting the sensor – a tripod is therefore essential when using this mode. Sharper images than ever before are guaranteed with an upgraded in-body IS system for the LUMIX G9. You can now shoot at shutter speeds up to 6 speeds slower and still get crisp results – perfect when using the G9 handheld with long telephoto lenses to capture distant subjects. Those all elusive nature subjects are now easier than ever to track thanks to an improved high-tracking autofocus performance, plus a shutter release lag of just 0.04 seconds – the fastest in the industry. There’s also no need to worry about missing the shot, as a frame rate of a market-leading 20fps is available at full-resolution with continuous autofocus (AF-C). Fix the focus to the first frame (AF-S) and you can enjoy an amazing burst speed of 60fps. As if that wasn’t enough, both 4K Photo and 6K Photo are on-hand to help you capture your best moments. Panasonic’s unique technology means you can shoot at up to 30fps (6K) or 60fps (4k) and extract a still big enough to make large, high-quality prints. Other handy features make use of 4K technology, such as Post Focus – where you can change the point of focus after shooting, and Focus Stacking, to change the depth of field after shooting by combining multiple images. The G9’s design offers both functionality and durability. A Status LCD on the top of the G9 – the largest in its class – helps you to see at a glance the settings you’ve currently got selected. A function (Fn) lever allows for rapid changes to settings, while a joystick is on hand to quickly change the focus point without the need to remove the camera from your eye. You’ll also find intuitively placed dials and customisable buttons to ensure the G9 works exactly as you want it to. The perfect shooting partner for the G9, Panasonic is also pleased to announce the first LEICA branded fixed focal length super-telephoto lens. Ideal for wildlife, sports and action subjects, the LEICA DG ELMARIT 200mm f/2.8 Power OIS Lens gets you closer to the subject while boasting sharpest-ever corner-to-corner image quality. 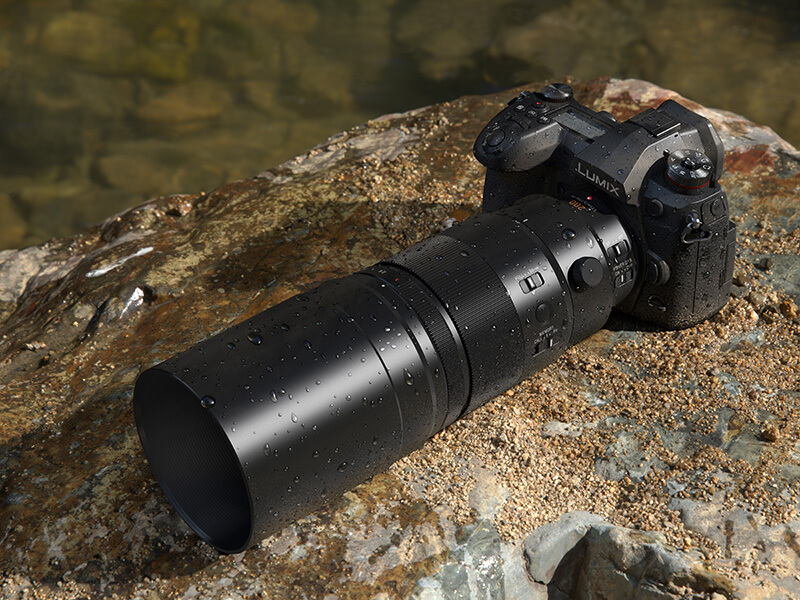 A 1.4x Teleconverter(DMW-TC14) comes bundled with the lens to boost the focal length to 560mm (35mm equivalent) – a nature lover’s dream. Available separately, the LEICA DG ELMARIT 200mm f/2.8 Power OIS Lens can also be used with the 2.0x Teleconverter DMW-TC20 for an equivalent focal length of 800mm. The fast f/2.8 aperture enables capture of fast-moving subjects, while the Power O.I.S (Optical Image Stabilizer) provides effective compensation for hand-shake, making it possible to shoot handheld, or in low-light conditions without the need for a tripod. The lightweight and compact design of the lens is also ideal for readjusting your shooting position on the move. The lens is designed with Leica’s stringent quality control, and is comprised of 15 elements in 13 groups, including two UED (Ultra Extra-Low Dispersion) lenses. This allows for high resolution, high contrast images with minimal distortion and chromatic aberration, perfect for all kinds of subjects, including shooting wildlife against a vibrant sun. Just like the G9, the LEICA DG ELMARIT 200mm f/2.8 Power OIS Lens is splash-proof, dust-proof and freeze-proof down to -10 degrees. A triple linear motor and max 240 fps sensor drive ensures autofocusing is incredibly precise – in fact it’s excellent enough to record 4K video.